We all have nightmares. Whether you’re haunted by visions of Freddy Krueger or showing up to school in your underwear, nightmares are a part of life. Sometimes, however, our nightmares emerge from the deepest recesses of our brain to terrorize us for real. That’s what happened to these RVers – whose camping trips turned into a walking horror show. From dangerous wildlife encounters to creepy criminals, these stories can strike fear in even the bravest of souls. Read on to hear some seriously messed up stories from life on the road. No camping trip is complete without a few creepy crawlers. So it’s not surprising when someone finds spiders inside their RV. Still, nothing could quite prepare RV blogger Carolyn Higgins for this late-night critter encounter. Carolyn was enjoying an evening inside her RV while getting it fixed up at a local garage. That is, until she caught a large black blob out of the corner of her eye. 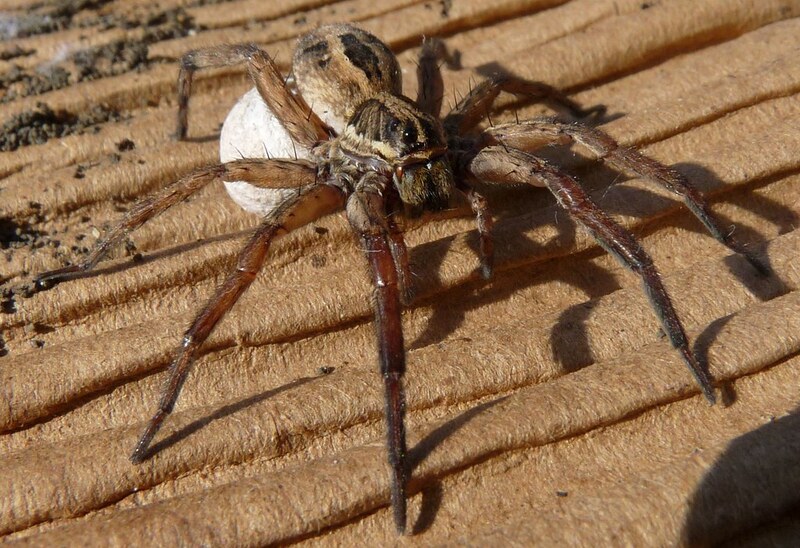 It turns out, the blob was actually the notoriously creepy Wolf Spider. To make matters worse, the spider’s noticeable bumps were baby spiders that ended up scrambling throughout the RV. Carolyn enlisted help from her mechanics, who were able to eventually catch the mother spider in a Tupperware bowl. But not before giving Carolyn some serious goosebumps. Be careful what you wish for. Camper Sami Graham learned this the hard way when she experienced a bear encounter during a trip to Book Cliffs, Utah. The camping aficionado had always wanted to see a bear in the wild. Her wish was granted when the bear tried to scratch and claw its way into her family RV. The bear made every effort to gain entry into trailer, going so far as to heavily scratch the trailer’s side and front door. Sami and her two kids helplessly tried to shoo away the bear from inside by slamming items, jumping up and down, and cranking up the volume on the TV. Thankfully, Sami’s husband arrived in the nick of time. The bear eventually scattered, but not before giving this mother and her kids some Revenant-style night terrors. Let’s face it: RV camping isn’t always a walk in the park. Life on the road is filled with daily challenges that don’t make it on the cover of MotorHome Magazine. RVers Heath and Alyssa Padgett share the struggles of full-time traveling on their RV blog. During one trip, the married couple had a near death experience while camping in Cheyenne Mountain State Park. Heath left Alyssa to attempt to hook the RV up to electricity. 10 minutes later, he reappeared drenched in sweat. Here’s what happened: the car rolled forward and pinned Heath against the RV. Heath accidentally left the car in neutral, a big no-no since the car was parked on an incline. Thankfully, some nearby neighbors heard Heath’s screams and helped him emerge from the RV sandwich unscathed. This is a good reminder to always remember to love thy neighbor – especially when they save your life. Note to self: remember to lock the door. Thankfully, this camper double checked her locks before her weekend RV retreat. This bone-chilling RV story comes compliments of Reddit user Derpravity. Her family of five decided to rent an RV and spend a night in the woods. Unfortunately, the previous renters didn’t clear out the septic lines so her husband made a late night trip to the store for some Drano. While he was away, the mother of three heard a loud clicking sound coming from the bedroom window. Eventually, the sound moved to the front door. The horrified camper was so rattled that she stood in the kitchen with a knife until her husband appeared a few minutes later. End of story, right? The next day, the rental manager noticed some damage when the couple tried to return the RV. Turns out: someone used a switchblade to remove the gasket around the window. The RV also had several distinct gashes near the door’s lock. Remind me never to go camping alone. Don’t talk to strangers. This sage wisdom came in handy during this camper’s family reunion trip. Reddit user KingGilgamesh1979 experienced his own stranger danger scenario when he and his cousin were left alone at a campground at age 10. The two kids noticed their fire was dying down and, using kid logic, decided to cut off tree branches to use as firewood. That’s when a car stopped in front of the campsite. The angry stranger was so upset at the kids for cutting down trees that he pulled out a gun. Thankfully, his parents arrived just in time and the crazed stranger drove away into the night. The next morning, however, the man returned and tried to try to break into the family’s RV. The whole scenario played out like a horror movie, right down to the shadowy figure hellbent on revenge. The deranged camper was eventually caught by the park ranger, but not before causing some serious psychological trauma for the child. And you thought your family reunion was bad! Bad drivers are everywhere. For every crafty parallel parking job, there are a dozen driving fails so ridiculous they belong in a driver’s ed book. Blogger AxleAddict witnessed one such fail, which involved a senior driver who had just purchased a new motorhome. The new RVer decided to opt out of his RV driving class in favor of a “learn as you go” curriculum. This was not wise. While trying to park his RV at a gas station, the driver had a full-on collision with one of the pumps thanks to his remedial driving skills. The impact was so intense that his coach actually caught fire. The driver climbed out of the RV unscathed but not before causing some serious damage to his shiny new vehicle (and his pride). Hey, at least he’s not this guy. We’ve all made a purchase we regret: from that questionable convenience store hot dog to that late night Amazon purchase. But perhaps nobody regretted a purchase more than Reddit user sschadenfreude. He bought a 1989 Fleetwood Flair motorhome that immediately required maintenance on everything from a nonfunctional fuel gauge to a leaky filler hose. After getting the RV fixed up, this unhappy camper decided to trade it in for a newer model. During the drive to trade in the RV, the engine shut down in the middle of the freeway. The horrified driver pulled to the side of the road, but couldn’t leave the RV because the door was blocked against a guard rail. After getting the RV towed, he later discovered that the wire harness caught fire and melted. The only thing that saved this driver from a fiery death inside a camper was a last second gas leak fix. Take it away, Ron Burgundy. © 2003-2017 tadibrothers.com. All Rights Reserved.